Color and hue play an important part in architecture because they evoke emotions in people that inhabit a space and define the architectural shape of a building. However, there is no color without light. So, color and light need to be considered together. The rusted steel solar shades at Pagliacci Main contrast with the adjacent white painted brick walls. 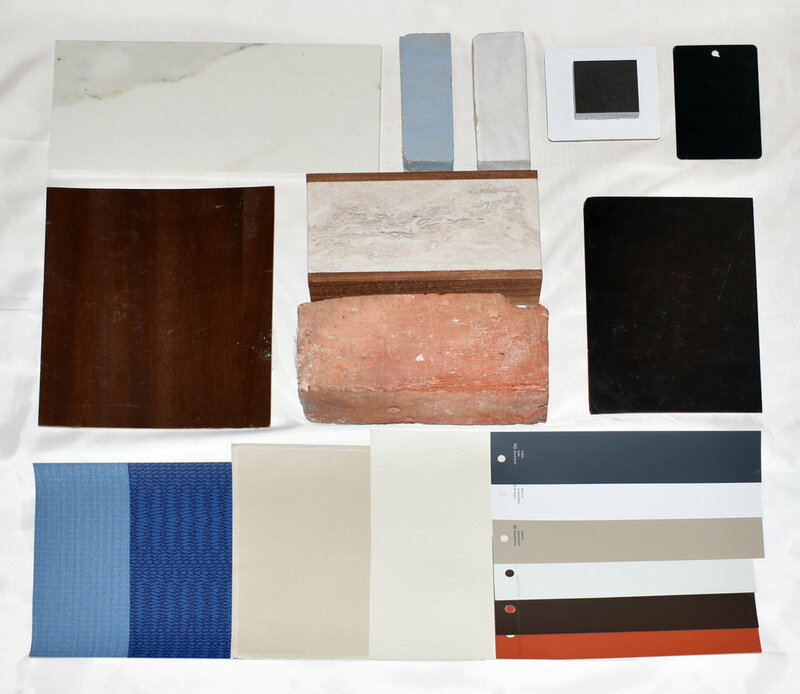 One approach to designing with color is to highlight or preserve the colors, grain, pattern, and texture of natural materials, such as concrete, brick, rusted steel and wood. When light hits the uneven or mottled surface of these materials, it expresses highlights and casts shadows creating more color complexity. Wood was added above the storefront system to complement the original brick walls and concrete floors of the Hastings Building. Drywall ceilings were painted white and the window frames black to let brick be the protagonist in the space. The windows provide natural lighting during the daytime and LEDs in the ceiling create atmosphere at night. Likewise, since these materials are either comprised of different alloying elements, aggregates, and/or once living cells, they can exhibit and take the application of color unevenly. For instance, within a cross section of walnut, the dense heartwood repels stain more than the younger sapwood which actively conducted water and minerals through the tree when it was alive. The difference in saturation adds to the visual complexity of the finished material and color. A good light source - natural or artificial - can further highlight these surface level differences. Another approach to selecting color combinations is to avoid using more than three colors in a composition. A general rule of thumb is to apply a neutral color to the largest surface, a more saturated color to the next largest area, and the most saturated accent color of all to the smallest elements. Sometimes we reserve the accent color for decoration, such as a piece of furniture, curtains or a piece of art. Sometimes, we incorporate it into the fixed elements of a design. Online tools, such as Benjamin Moore's color viewer are great resources with which to explore color. 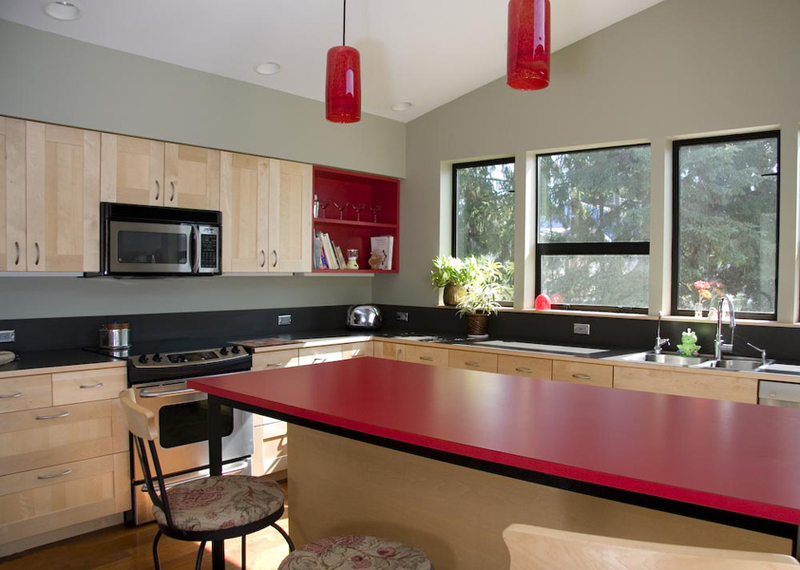 With a color in mind, you can search for complementary color combinations or corresponding shades. Ultimately, there is no substitution for taking a brush to paint and applying a sample to the wall as the proportions of a room, size and orientation of the windows and color of surrounding materials will impact the paint's appearance and feel. Architecture requires a balance of material/color and illumination. When these elements work out, spaces can become comfortable places for people to live and work. FSA voted one of the best restaurant architects in Seattle!